This is the pommel for Longclaw. In the books it is described as carved stone, but it isn’t feasible to mass produce a stone carving, and a cast stone-like product (aka resin) just wouldn’t be that durable. So the pommel will be cast metal. We went through numerous design revisions with GRRM on this as well. There were versions with the wolf’s mouth open, the ears back, looking up full in profile, looking up just in relief, and the looking forward version you see here. 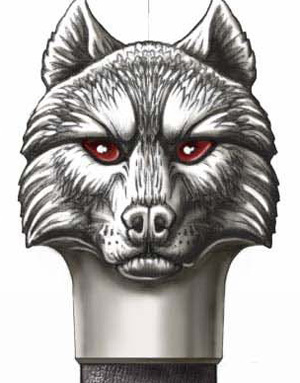 In the end GRRM chose this design with the wolf looking forward, mouth closed, and ears up. 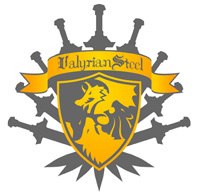 So the way it will be displayed on the plaque is with the wolf’s head looking out towards you. In manufacturing news the 3D computer models of the handle parts are nearing completion and the COAs have arrived from the printer. So this week we will be sending all those COAs to GRRM for signing. Hopefully signing his name so many times doesn’t interfere with his writing or typing ability for A Dance with Dragons.